Design, production and marketing of military and law enforcement textiles and armour on the international market. Design, production, installation and marketing of vehicle armour. Marketing and distribution of US and European manufactured defence products on several market. Personal equipment for the military, law enforcement and security community in Norway. Products and services connected to vehicles, aircraft and vessels within the Norwegian defence forces. 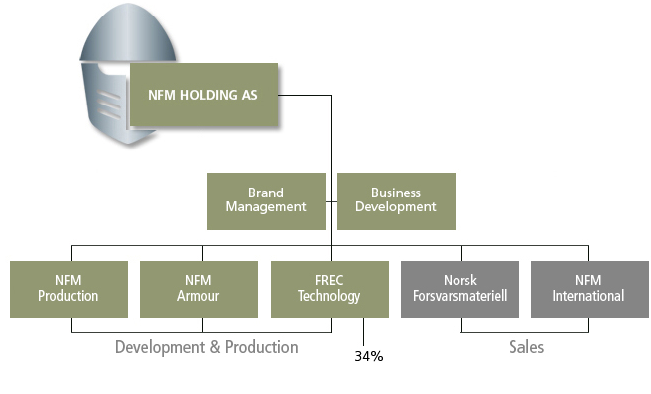 The NFM Group has a Norwegian owner society and an International production and marketing structure. The NFM Group is therefore to be found on a number of geographic locations in Norway, Poland and Sweden. NFM Group is a premium manufacturer within the field of hard ballistic armour. The main focus of this dept. is development and production of hard ballistic components and plates for personal use, but the patented technology also offer add-on components for vehicles and installations. Vehicle protection, with a specialization in ballistic armouring. The company provides tailor-made solutions for operations in complex threat environments. Today NFM Group Vehicle Armour dept. has more than 20 years experience in delivering protection to an international client base and works with a wide range of materials to produce solutions from lightweight armouring to heavy-duty mine protection. The EC Paint is produced according to the European regulations for environment protection. Today, it delivered the EC paint in large quantities to users all over Europe. EC Paint is manufactured in order to meet military standards for Near Infra Red reflectance needs. EC Paint is available in cans of 400ml for personal equipment or in 5 ltr. for vehicle applications.